The crew, an American astronaut and Russian cosmonaut, were only minutes into their flight when a red warning light started flashing and alarms began to blare. Within seconds, their small capsule fired its engines and began hurtling away, trying to put as much distance as possible between the crew and the rocket that was supposed to propel them into orbit but had instead malfunctioned. The 30-minute descent back to Earth violently shook the crew, subjecting them to the crushing pressure of nearly seven times the force of gravity. The capsule eventually parachuted safely to the ground, and the rescue teams collected the crew and reunited them with their families. Bridenstine has served as NASA administrator for nearly six months, and they have been quite eventful. Under the Trump administration, NASA put a renewed and intense focus on returning Americans to the moon. The agency lofted several exciting missions into space, like the Transiting Exoplanet Survey Satellite, to discover planets around the brightest stars in the sky, and the Parker Solar Probe, to study the mysterious properties of our sun. At the same time, NASA has struggled to complete projects that remain on the ground. In June, officials announced that the James Webb Space Telescope, the scientific successor to Hubble, which was supposed to launch in October 2018, would be delayed until March 2021 and require $800 million more to complete. Development was plagued by technical mishaps by the project’s contractor, Northrop Grumman, a federal report found. In October, NASA said its burgeoning astronaut transportation program will continue to run behind schedule. The first test flights by SpaceX and Boeing, the companies providing the technology, have been pushed to 2019. And last week, the office of NASA’s inspector general published a scathing report about the Space Launch System, the rocket the agency hopes will someday carry astronauts to the moon and beyond. The blame fell once again on the project contractor. Boeing, the inspector general determined, was responsible for billions of dollars’ worth in delays. I spoke with Bridenstine on Thursday about the nerve-wracking Soyuz launch failure, the state of NASA, and his plans for the agency. Our conversation has been lightly edited for length and clarity. I went inside the house and started listening to the data that was coming. It was coming in in Russian, and I had an interpreter with me. At one point, I heard the interpreter say that [the crew told flight controllers] “we have a feeling of weightlessness.” And I thought that might be a little odd this early in the launch, because they were still being propelled [to orbit]. And then I heard the interpreter say that “we’re feeling 6.7 G,” [6.7 times the force of gravity bearing down on them] and that’s when I realized that this has been a launch abort. Rogozin stood up and he was speaking Russian with all of the engineers and technicians that were around, and then he just left the room. We got on our bus and headed back to the area where the American engineers and experts were. On the way there, we were communicating via text and phone, we were trying to figure out where are they in the launch abort process. Because at this time, they’re 200 miles downrange, so we can’t really see anything, and the communications way out there are not good because it’s literally over the middle of nowhere in Kazakhstan. So we lost communications for a matter of minutes. Eventually we got it back. The crew was communicating with the rescue helicopters and they were saying that they were in good condition. The rescue helicopters got out there and got them. They went to an outlying field, an airplane went and picked them up, and brought them back to Baikonur, Kazakhstan, where I was with Nick’s family. We got everybody back together and it was very emotional, a very difficult day. But everybody came home safely, and we were all thrilled about it. Koren: Did you consider in those moments, as this was happening, that you could potentially have to make a very different to the country back home, depending on the outcome of the landing? Bridenstine: Absolutely. That was on my mind the entire time, especially when the last communication that I heard from the crew was that they were at 6.7 G. And then we didn’t have communications for a matter of minutes. Might have been as many as five minutes, but it seemed like it was forever, it seemed like it just kept going on and on. I was thinking about Nicks’ family and our own NASA family and the American space program, and what this is going to mean to all of it and how we’re going to communicate that. Bridenstine: I absolutely do. The last time the Soyuz system had a launch failure was in 1983. It was a successful launchpad abort and everybody walked away healthy. There haven’t been any failures with humans on board since then, so this is a very resilient system, it’s a very safe system. It really is one of the most resilient and capable human launch capabilities that has ever existed. We have a really good understanding of what happened and Russia has been very cooperative in sharing information and data as they get it. We’re trying to evaluate why it happened and make sure it doesn’t happen again. Koren: The day after the emergency landing, back in the U.S., NASA’s inspector general released a pretty critical report on the progress of the Space Launch System. It mentioned schedule delays and cost overruns that are in the billions, it criticized Boeing’s performance, and even questioned whether this program was sustainable in the long term. What should give taxpayers confidence that the SLS is still worth building? Bridenstine: [Unlike the Commercial Crew program,] the Space Launch System is not designed or built for access to the International Space Station. It’s not designed or built for low-Earth orbit. It’s designed as a deep-space transport. It’s the largest rocket that’s ever been built, it’s taller than the Statue of Liberty. If we want to have a long-term, sustainable architecture at the moon that includes international and commercial partners, SLS and Orion are a massive part of that. It is true that it is well behind schedule and well over cost. The IG report that came out, of course, was not pleasant, and doesn’t make anybody here at NASA happy. But there’s a lot in there that we need to take to heart and learn from because we absolutely must be successful in building this sustainable architecture at the moon. We want to be better, we want to learn, we want to move forward, and I think we’re going to be able to do that. The IG report is a good self-awareness tool for NASA and for Congress. And you’re right. It’s not just the Space Launch System, it’s not just the Orion crew capsule, it also includes the James Webb Space Telescope and other programs as well. The answer is we have to be better as an agency at accountability and making sure that the we are either awarding or properly incentivizing our contractors to deliver on time and on budget. We also have to be a lot smarter about how we buy things. We have to know as much about what we’re buying as the contractor knows about what they're delivering. We can’t be fooled into thinking that they can produce sooner and at a lesser cost than they can actually produce something. Bridenstine: I don’t know that “fooled” is the right word. I think the right way to think about it is this: What we’re doing has never been done before. It’s all brand new. We don’t do production, we do development. When you think about how a company goes about building maybe a couple thousand jet aircraft, that’s production. When you think about building a rocket that’s going to be used once every year at the most, that’s development. We can’t really amortize that over the course of 2,000 launches because there won’t be 2,000 launches. What I’m saying is, we have to be as smart about how we acquire these things as the contractor is in how they’re going to deliver these things. Bridenstine: NASA is working with Roscosmos, and Roscomos is leading the investigation. It was originally led by Energia [the Russian manufacturer of the Soyuz spacecraft], and we were seeing some articles that were not appropriate. [Editor’s note: Articles like this one, which reported comments from Rogozin in which he suggested the hole could have been made intentionally, fueling rumors about sabotage.] Energia is no longer doing the investigation. My agreement with Dmitry Rogozin is that we’re not going to prejudge the outcome of the investigation until it’s complete, and I want to make sure that my relationship with him stays very strong. 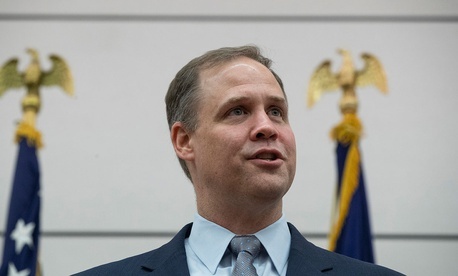 So until I get the results from him, I really don’t want to comment on it in the public, because it will not be good for NASA or Roscosmos if we do things that undermine this relationship. Bridenstine: The biggest surprise has been how the international community is ready to go to the moon. I’ve had meetings with my counterparts at the heads of various space agencies from around the world. Every time I go to one of these events, I’m always going to sell them on our agenda to get to the moon with a sustainable architecture, and they’re ready to go. They’re just saying, tell us what you need us to do and we’ll go tell our governments and we’ll be on board. It’s really an amazing testament to American leadership and I was not anticipating it being this smooth. There’s a lot of work to do, don’t get me wrong, but everybody is really, willing, and able to go back to the moon. Bridenstine: Well, he’s not opposed to the moon, he just wants to get to Mars as soon as possible. And the moon is our best way to get to Mars as soon as possible.